Here's one to save for the holidays - it's good all year round, but I'd particularly recommend this to end a heavy holiday meal. Frozen cheesecake is always good (I have two other versions, here and here) but this one is really quite something. Orange compound might sound fiddly but can be prepared well in advance, and it's not at all difficult. Place 200 g in a bowl and let it cool completely. Cream the cheese, egg yolks and the sugar. Beat the cream until it forms stiff peaks. Carefully blend with the cheese cream. Beat the egg whites until stiff, and fold those in too. Stir in the orange compound. Pour carefully on top of the crust in the pan. Put in the freezer for at least six hours or overnight. 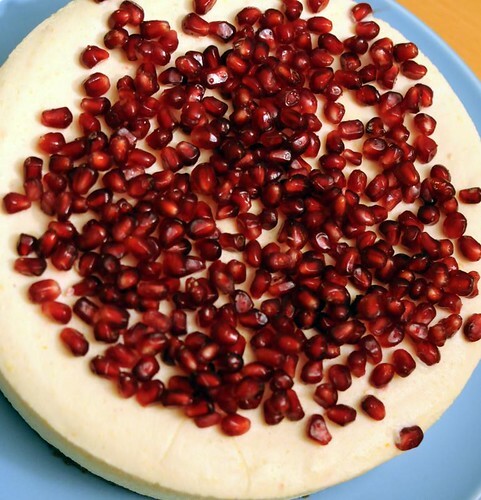 Take out about twenty minutes before you want to eat, and decorate with pomegranate seeds. This keeps well in the freezer. That sounds lovely - nice fresh flavours are very welcome over Christmas when everything seems to be getting rich and heavy. Hi Anna, what are you supposed to put 200 g in a bowl? Cream cheese? The colder it is the harder it is to blend it. I am not sure if you mean cream cheese then. do i use orange segments for the compound or the entire orange peel and all? Porsche Hughes- the entire orange, peel and all.